This is Deepstaria enigmatica, first described in 1967 after being found at a depth of about 725 m (2,380 ft). It's a jellyfish! But a rather strange one. Utterly insensible! 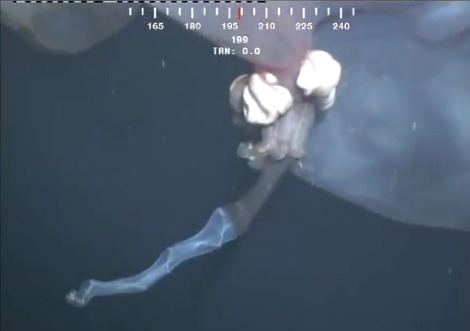 When people saw this video there were two chief suggestions for what on earth it is; jellyfish or whale placenta. 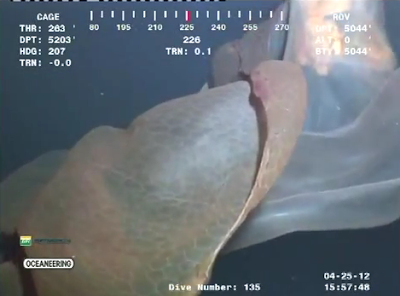 But this thing is 1,560 m (5,225 ft) deep! We have humans who eat human placentas, we surely have surface dwelling fish and all sorts who eat whale placentas. We know that there are deep sea creatures who eat far worse. No. It's a jellyfish. We just have to understand what's going on here. 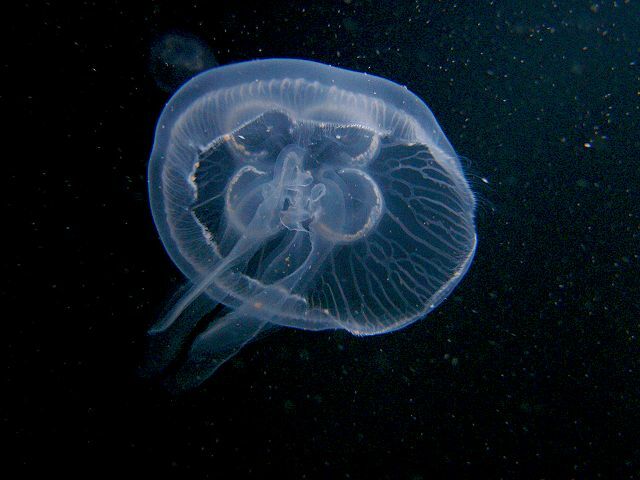 So let's take the good, old fashioned Moon Jellyfish. It looks like an upside-down saucer, with tentacles around the edge and oral arms hanging from the middle. It has 4 gonads, seen as those circular things on the top. Let's make it massive. 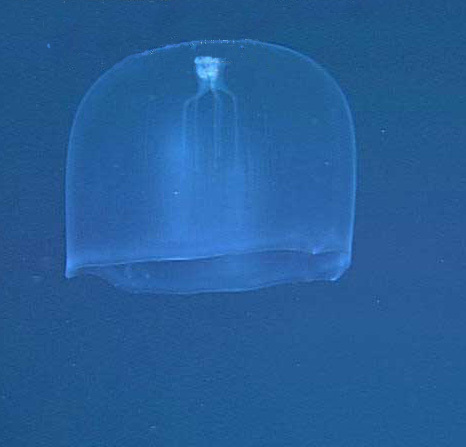 Deepstaria are said to be one of those rare, deep sea jellyfish that can reach 30 to 70 cm (1 or 2 feet) across. Grow that bell so it goes from an upside-down saucer to an upside-down bowl. Then keep going until it's more like a right-way-up lampshade. Wait, that's not words... never mind. Deepstaria are about as weak as they appear on the video. The bell is just too big and thin for the kind of muscular contractions that other jellyfish are capable of. That's why we see it wafting around like a plastic bag in the wind, even getting turned inside-out by the human activity going on down there. They usually have a little more dignity than that. It's thought that they really act like a bag. Just sitting there, waiting. Their swimming activity probably does little more than stop them sinking. What they want is for prey to swim upward and get caught in the bell. Then they can shut it and set their stings to work. As prey struggles, they'll get stung repeatedly unto death. As their food is digested it washes along the strange, mesh-like network which is their gastrovascular canal system. It looks like a fishing net, which is quite appropriate. Also they have weird looking gonads. At least they're quite unique among jellyfish, all of whom typically have weird looking gonads. And that's the amazing thing; jellyfish are all ridiculously strange, yet a whole bunch of them are strange even on jellyfish terms. So strange that "whale placenta" sounds like a plausible, alternative explanation. We at Real Monstrosities have long known of this phenomenon: if it looks like an internal organ, it's probably from the deep sea. UPDATE: Great new video of Deepstaria in all its peculiar glory!